Google+ is starting to gain some traction — albeit it small, compared to Facebook and Twitter — but, it might not find a niche as a way to replace Facebook and Twitter as social tools for personal and professional use. It might actually be the perfect tool to finally bring a universal social networking tool into the classroom. I look at some of the ways Google+ can change the social network game in education after the jump. First of all, you need to make the decision (or check with your school/district office personnel) as to whether or not you want to engage your students in an activity that isn’t directly monitored or administered by you. Because Google+ is open, you will not have administrative rights as to what is posted on the social network. You have your groups in class: blue, red, green; circles, squares, triangles; low, medium, high. Whatever they are, you have them, and you’re used to using them to break your students up into centers, or to assign level-appropriate homework. Well, why not do the same for on-line? With Google+, you can create Circles (social network groups) named after your classroom groups, and add the appropriate students to these Circles. Then, when you want to post an assignment, provide feedback on that day’s in-class activity, or simply send them a message, you can do so without sending it to the entire class. Get creative with your groups. Setup one for your different levels of English Language Learners, or any GATE students you have. Remember: the key here is Google+ allows you to differentiate your social network. Unlike Facebook, you don’t have to share everything with everyone. You can control the stream of your posts. Don’t leave Circles for just you; let your kids get in the act! Encourage your students to create Circles for their friends. Did you assign students to work in groups to present on an American Colony? Then, they should create a Circle for that project, and archive all of their discussions inside that Circle. Students can also use this for extracurricular activities. They can have Circles for book clubs, after school programs. Handball was an extremely competitive sport at my school. Why not have them create a Handball Circle, and challenge each other, provide sportsman-like encouragement, and setup tournaments through the Circle? Google+ forgoes the “Like” and “Retweets” for a +1 attitude. What this means is that if you, or others, like a post, you can “+1” it. While simple in its use, students can post ideas, journal entries, even essays in Google+ and collect “+1″s. In addition to that, commenting (just like in Facebook) is available. Yes, it’s competitive, but it’s a healthy form of competition, and one that will get your students writing during days and hours that were previously consumed by television and video games. And, students receiving social network feedback on writing is a very, very big deal in improving their writing proficiency. This is probably the easiest one to setup. At Back to School Night, collect your parents’ e-mail addresses (hint: use a Google Form on a dedicated computer in your room to automatically collect them all in a usable spreadsheet), and invite them to Google+. Then, create a Parents Circle, and use it as your main stream of communication to parents. They can view all of your announcements from there, and even “Share” it with their child to their “Family” Circle. Google+ allows users to take a post from another person (e.g. the teacher), and share it out to another Circle (e.g. the parents share with the child). 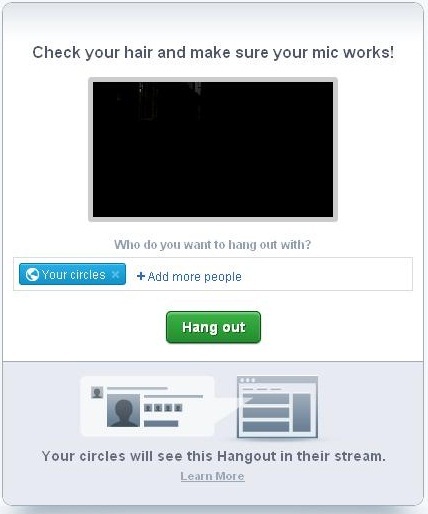 One of the most different features in Google+ from Facebook and Twitter is the “Hangout” feature. At first glance, being able to turn on your webcam, and make yourself available for a video conference may seem superfluous; however, if you think of how often our children must go home and feel alone with their homework, it quickly becomes a must-have tool. It’s after school, you’re in your room planning for the next day/week, why not turn on your “Hangout” status, and students, either at home, library, bookstore (what are those? ), or anywhere with an Internet connection can now jump in and ask you an impromptu question. You may not always want to make yourself available. Perhaps think of setting up limits (e.g. “I’ll be hanging out in Google+ Tuesday and Thursday until 4:30”). These are just a few ideas on how using Google+ can overcome some of the barriers Facebook had in place, keeping social networks out of the classroom. It doesn’t solve all the issues, but it does bring a few fresh ideas (e.g. Circles and Hangouts) to the table that make it a viable choice.